I was always fascinated by electronics. Both of my parents finished as electrical engineers, so the current flows in the family (pun intended). It’s certainly a wonder in itself that I ended up in social sciences but that’s another story. My “freelance” contracts are about to end, and I grew tired working all days and nights, so pursuing new ones wasn’t an option. I decided that I need a new hobby. Of course it must be computer related, and it must involve building something physically. Creating mobile apps are certainly fun, but you get the hardware as given, can’t really stretch it (especially on the iOS platform). Long story short, I decided that tweaking microcontrollers and breadboards is the next thing I want to do in my spare time. I checked the market and found some great tools. I was fascinated by Lego Mindstorms, especially by the sheer awesomeness of this Sudoku solver robot. But I didn’t want to spend that much money, so eventually I settled with Arduino. It seemed as a reasonable compromise: extensible beyond imagination, works with any standard electronic component (certainly avoiding vendor lock-in), free software and massive community support (not to mention it’s open source). And it is definitely cheaper than a Lego robot. I thought it would be nice for starting out. I ordered a starter kit and waited patiently. To ease the pain of waiting I got two books, Beginning Arduino and Electrical Engineering 101. 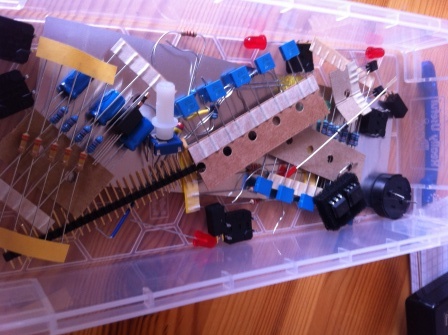 A bunch of electrical components crowded in a box intended to use with an Arduino microcontroller. Plenty of stuff and completely incomprehensible for a total starter in electrical engineering like me. At this point comes the community support very handy. I googled all the components adding “arduino” in the beginning and started building what I saw in the results. It’s tremendously funny and you learn a lot about your gadgets (which ultimately use the same components only in a much more compact form). Arduino certainly encourages experimenting. I have a great time sorting things out, how to connect them, and eventually make them work as I intended. Sure, you can’t be as careless as if you were sketching source code in a hobby project, where you just fix things up if it doesn’t compile. It’s pretty easy to fry circuits and equipment and this is a further entertaining factor (at least it is for me). You better understand what you are doing (and why you are doing it) in order to prevent damage which of course forces you to learn things. I don’t really know if I’d publish some sample projects I did because I’m such a starter that I might do things terribly wrong, and I don’t want to be blamed for dead Arduinos. But should I build something awesome, I’d post it here for sure.